One wonders what goes on in the heads of politicians sometimes. Perhaps not much other than a warped sense of their purpose in life – which for some seems to be to advance themselves rather than advance societal well-being. In recent days, fiscal debates have raged on both sides of the Atlantic. In the US, there is the Trump tax cut debate. The correct progressive response would be to focus on why these cuts will not advance anybody but the rich and will do very little if anything to create new jobs. Unfortunately, prominent Democrats such as the awful Nancy Pelosi have been spouting stuff about the tax cuts increasing the federal deficit and federal debt. At a time, when the Republicans are abandoning the deficit terrorism to advance their own interests, the Democrats seems to be reinforcing the ‘deficits are bad’ narrative. Instead, they could have seized the opportunity to say to the American people – see deficits are fine but the real issue is what we do with them. Pelosi and her ilk seem incapable of adopting that quality of leadership. In the UK, the reality is dawning on the British government that the austerity harvest is anything but what they had hoped it would be. No surprises there. Austerity undermines growth which can easily increase the fiscal deficit when the goal is the opposite. But the way that reality is being handled in the progressive press is pathetic. The UK Guardian, for example, has headlines about ‘black holes’ and is giving oxygen to reports that talk about the deteriorating fiscal situation in the UK. Readers are left with nothing but neoliberalism reinforcement of the ‘deficits are bad’ myth. A shocking indictment of the progressive debate in the UK. Pelosi seems to think a sequence of inane blogs is how to demonstrate progressive leadership. For example, over the last few days. She (or her advisors) can obviously accomplish simple tasks like division – calculating that if total debt is X and the number of Americans is Y then X/Y can be defined. No matter how meaningless the outcome of the calculation is we should at least applaud her arithmetic skill. That seems to be about the extent of her skill base. And imagine what she will say now that Twitter has doubled our Tweet character limit. Scary really. But it confirms that Pelosi as a leading Democrat Party politician and spokesperson either has little idea of what she is talking about or is deliberately spreading lies for her own ends. Either way she should resign immediately and apologise to the American people for being so stupid or so devious – take your pick. Pelosi was railing against Donald Trump’s tax plan. There are many things a progressive can say about the plan and none of them include any concern about the US federal fiscal deficit or government debt rising. For example, the plan appears to channel the benefits disproportionately towards corporations and high income earners, and provide little relief for low income Americans, who have been enduring cuts to welfare and flat wages growth for years. So the tax cuts are unlikely to stimulate spending and jobs but rather bolster profits and private wealth accumulation at the top end. That should be a concern for progressives. The motivation is nothing to do with ‘envy’ but the damage that inequality does to a society and its economy. Even the IMF these days has admitted that inequality is bad for growth. It is also bad for democracy because it further tilts the power into the hands of the wealthy, who, arguably, have little need to see general well-being advanced ahead of their own interests. Quite apart from the moral issues, there are two major and interlinked issues are: (a) economic; and (b) political. Even if you don’t buy into that value system, it is now clear that the trickle down claims made at the outset of the neo-liberal period are lies. Please read my blogs – Trickle down economics – the evidence is damning and Inequality and growth and well-being – revolutions have occurred for less – for more discussion on this point. Rising economic inequality is bad for economic growth. It undermines the capacity for individuals to invest in education, which is the most reliable source of economic development (skill development). But this is also tied in with the deficit mania. Those with the highest incomes and wealth spend millions lobbying governments to pressure them to introduce policy structures that perpetuate the inequality. The lobbyists come from sectors that lead the charge when it comes to berating governments about fiscal deficits and spending on income support for the most disadvantaged people in society etc. But at the same time they are demanding welfare cuts to the poor, they are also manipulating governments to hand out as much public spending in the form of corporate welfare that goes largely into their own pockets. And the rest of are largely silent because we have bought the myth that regulation is bad, that welfare for the poor erodes incentives. Pelosi berates Trump for increasing the deficit, thereby reinforcing the narrative that deficits are bad and things that lead to a deficit are to be avoided. The deficit mania is part of the myth that free market allocations are the most efficient because they respond to the preferences of all consumers. But it is obvious that a system of allocation that responds to spending will distort the allocations in favour of those who spend the most. The market is driven by dollar votes. The more one spends the more power one has. So even at the most elementary level the concept of a free market is flawed. There is no such thing. It is preferences backed by cash rather than the latent desires that the market responds to, even in the abstract theoretical models. But then once the inequality reality is overlaid onto that narrative and we recognise the massive spending that is designed to lobby for particular policy environments, which further distort the market allocations, we realise that the concept of the free market that is taught in economics programs throughout the world is a myth. It is a convenient metaphor to give the impression that we all have a chance and the market will deliver outcomes according to our efforts. These are the reasons progressives should oppose Trump’s plan in the US which is masquerading as a jobs plan. The tax cuts will bias the purchasing power gains to the rich who are likely spending as much as they want at present and accumulating the rest in assets. If we want the US to stimulate more jobs – and there is a dearth of jobs at the lower ends of the pay distribution that would dramatically improve the lives of those unemployed and underemployed – then that requires a boost to aggregate spending (demand). Tax cuts can do that if they are targetted at the income segments that spend the most – the low income earners. Handing more funds to the rich will just result in more asset shuffling and casino-like behaviour and do little for the vast majority of Americans. And – to put a finer point on it – the federal deficit in the US should be higher to improve public infrastructure and generate more low income jobs. That should be the progressive line. The Democratic Party, long ago, ceased to give voice to those sort of concerns. Their DNA is now firmly neoliberal. Despite government deficits rising after the GFC and the skies remaining firmly above our heads; despite central banks expanding their balance sheets with rather massive asset purchase programs (which effectively have been funding government deficits) and inflation remaining low as have interest rates, there are still economists and commentators out there who perpetuate the mainstream macroeconomics lies. In the UK in the last few weeks, hysteria has been centred on the latest fiscal estimates. It is enough to straighten one’s wavy hair reading through it all. For an organisation named the “Institute for Fiscal Studies”, the British-based IFS does a lot of propagandising and less study. The UK Guardian reported on the latest IFS release (October 30, 2017) with the headline – UK faces new £20bn budget black hole –as it happened – invoking a sense of a live coverage of the unfolding fiscal train wreck that the UK Guardian thought would be attractive to its readers. Live coverage of cricket matches where balls are bowled and hit on a regular basis or football where balls and kicked and goals scored more or less regularly (unless it is soccer and then you fall to sleep before a score is recorded :-)) might warrant a “as it happened” sort of treatment. But the “£20bn budget black hole”! 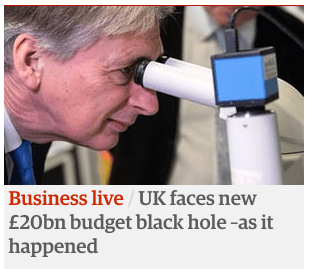 This was the front page feeder for the Guardian (October 30, 2017), evidently trying to invoke an image of Phillip Hammond looking into a “black hole”, although informed readers would know that you do not view such astral phenomena with microscopes. But precision is not the Guardian’s thing these days. I sought some expert advice – on black holes not fiscal matters. Apparently “Black holes do not go around in space eating stars, moons and planets” and “no black hole is close enough to the solar system for Earth to do that”. So they sound scary, given they are about stars dying and collapsing but informed opinion suggests they are not planet-eating monsters! But they appear to be relatively benign in fact although the UK Guardian is obviously trying to trigger metaphorical associations that black holes are really bad things – about to explode, dangerous, undesirable, dark places, to be avoided at all costs, a sign of deterioration and all the rest of it. Once again, we have the so-called independent press just mouthing the press releases that the ideologically-motivated and plain wrong IFS pumped out to make it seem relevant and thus continue to attract funding etc. The likes of Pelosi would have tweeted about that too – maybe she should broaden her vocabularly and include a few black hole tweets to go with her ‘we are loading debt onto our children’ narrative. But where could Hammond raise money from? It also said that the IFS report is “a grim assessment of the challenge facing ‘Spreadsheet Phil’ Hammond”. It looks like he will face a substantial deterioration in the projected state of the public finances. The key backdrop to all fiscal events in the UK since the financial crisis has been the weak performance of the economy. At the time of the March 2017 Budget, national income per adult was around 15% lower than it would have been had output per adult instead grown by 2% a year (close to the post-war average) since the start of 2008. Despite this historically poor performance, weak growth was forecast to continue. And obviously, due to the operation of the automatic stabilisers (built-in to fiscal policy) tax revenue is lower because growth continues to be below expectation (flawed estimates) and household incomes are lagging. What else would you expect from a sequence of Chancellor fiscal decisions since June 2010 that have primarily been aimed at cutting the government deficit and achieving a fiscal surplus at a time that non-government spending has been well below historical strength. And, with debt levels in the non-government sector being at record levels. What else would you expect but below par growth, rising pressure on fiscal deficits, and continued weakness in household spending? The point is that the problem is not the rising deficits. They are just the signal (the canary in the mine) that the underlying fundamentals in the economy are poor. And to put those fundamentals back in some sort of sustainable balance requires larger discretionary fiscal deficits for extended periods, which is the opposite to the quest for fiscal surpluses. George Osborne immediately made matters worse in June 2010 (his first fiscal statement) by pursuing austerity. He recanted somewhat in 2012 but still couldn’t bring himself to reverse direction as he should. The Tory growth strategy was always predicated on more household debt driving spending growth, which they claimed would give the government space to reduce its deficit on the back of higher tax revenue, without compromising growth. That strategy was never going to deliver on its promise. Household debt accumulation is finite and cannot be used as an on-going spending growth source in the face of increasing austerity from the government sector. Recession is the only end-point of that strategy. Progressives talk about Brexit killing growth but that is just a ruse to vent their spleen about the outpouring of democracy that has allowed Britain to exit the dysfunctional European Union. The poor growth future was laid out in June 2010 and will continue until the British government accepts the fact that it can spend more to support growth and allow the non-government sector to restructure its balance sheet away from a reliance on debt. The GFC was an example of a ‘balance sheet recession’, which as I explained in this 2009 blog – Balance sheet recessions and democracy – require fiscal support for the non-governemnt balance sheet restructuring process to be maintained for many years. Reverting to austerity during the GFC was the worst example of policy incompetence I have ever seen. The Eurozone has been crippled by that incompetence, which is built in to its so-called rules. But Britain had no such rules. Its policy incompetence just reflected the ideological inanity of the Tories and the progressives that mimicked the same narrative – ‘balanced budgets’; fiscal surpluses, etc. 1. “substantial deterioration in the projected state of the public finances”. 2. “rosier picture for the public finances”. 3. “greater underlying improvement in the public finances”. All of which are meaningless in the context they are applied. They only give meaning if one adopts the neoliberal view that deficits are bad and surpluses are good, which, of course, is an erroneous conclusion to draw. Public finances cannot perform better or worse. It is time that we stopped thinking in these terms and understood what the fiscal balance is and what the capacity of the government is in relation to it. We might start by reading this blog – A voice from the past – budget deficits are neither good nor bad. Then there is this blog – Time to end the deficits are bad/surpluses are good narrative. And then the British Labour Party should pay heed to these blogs – Jeremy Corbyn’s ‘New Politics’ must not include lying about fiscal deficits and Seeking zero fiscal deficits is not a progressive endeavour. The point is that fiscal policy has to be flexible – expanding and contracting its influence on the economy as the spending patterns of the non-government sector relative to real productive capacity require. The point is that structural fiscal balance has to be sufficient to ensure there is full employment. The only sensible reason for accepting the authority of a national government and ceding currency control to such an entity is that it can work for all of us to advance public purpose. Once the private sector has made its spending (and saving decisions) based on its expectations of the future, the government has to render those private decisions consistent with the objective of full employment. So then the national government has a choice – maintain full employment by ensuring there is no spending gap which means that the necessary deficit is defined by this political goal. It will be whatever is required to close the spending gap. However, it is also possible that the political goals may be to maintain some slack in the economy (persistent unemployment and underemployment) which means that the government deficit will be somewhat smaller and perhaps even, for a time, a fiscal surplus will be possible. But the second option would introduce fiscal drag (deflationary forces) into the economy which will ultimately cause firms to reduce production and income and drive the fiscal outcome towards increasing deficits. Ultimately, the spending gap is closed by the automatic stabilisers because falling national income ensures that that the leakages (saving, taxation and imports) equal the injections (investment, government spending and exports) so that the sectoral balances hold (being accounting constructs). But at that point, the economy will support lower employment levels and rising unemployment. The fiscal balance will also be in deficit – but in this situation, the deficits will be what I call ‘bad’ deficits. Deficits driven by a declining economy and rising unemployment. So fiscal sustainability requires that the government fills the spending gap with ‘good’ deficits at levels of economic activity consistent with full employment. Fiscal sustainability cannot be defined independently of full employment. Once the link between full employment and the conduct of fiscal policy is abandoned, we are effectively admitting that we do not want government to take responsibility of full employment (and the equity advantages that accompany that end). Some deficits are good; some are bad. Prohibiting them, or make them more difficult, not only limits the ability of the government to stabilize the economy, but can be positively destabilizing. That should allow you to see that talking about a rising deficit as a “deterioration” and a falling deficit as being a “rosier outlook” has no context or meaning. It is just a statement of mainstream biases which are erroneous. In the current UK climate, IFSs ‘rosier’ outlook is, in fact, a sign of policy failure. And the deteriorating outlook is because the government is allowing the automatic stabilisers to dominate in a lower than expected growth situation, driven by the austerity stance of the government. The Labour Party, Democrats, Greens and all the rest of those with alleged progressive intent should stop thinking in terms of the deficits are bad frame. Or the deficits are okay sometimes frame. Or that we have to run surpluses to offset deficits over some cycle frame. They should be focusing on advancing well-being and creating full employment and the deficits will take care of themselves – at whatever level is necessary to achieve those things. Which might be a surplus for some nations depending on the state of their external sector and the private domestic sector’s saving aspirations. Who would have thought that. And I haven’t even written about the Paradise Papers yet – it is difficult to get my head around the stupidity of the Left who are focusing on getting money from the rich who are hiding it in tax havens (many of which are created by the nations themselves that are ‘losing’ the tax revenue) so that the government can have more money to spend on services to the poor. That level of inanity surpasses Pelosi’s brain dead Twitter interventions. I read some articles on HuffPo by Warren Mosler. Mainstream media and politicians get economics 180 degrees backwards! Mosler even demostrated how Nobel winning economist Paul Krugman get things wrong 180 degrees backwards too. I understand, re: your final sentences, that you would perceive the offshoring rich as voluntarily taxing themselves until they spend their hoards back into the economy… but given the perceived injustice (ordinary folk don’t get that choice to pay or not pay taxes, or to pass the ‘onus’ of taxation onto the next party in the spending chain), as well as the sense of power that the “potential energy” of all that stashed and untaxed wealth gives not only to its owners, but also to its possible recipients (I’m thinking e.g. lobbyists or revolving door politicians), then what would be the harm in closing down tax havens and making the rich pay their taxes like everyone else has to? Looking forward to your blog, should one be forthcoming, on the Paradise Papers, and your position on the matter. You’ve not heard of pension contributions then? Last time I looked they’d become compulsory. So yes they do get the choice. There is little functional difference between a ‘pension fund’ and an ‘offshore Sterling savings account offering remittance taxation’. Both are fantasy capital numbers that give an illusion of wealth that may, but not necessarily, translate into real goods and services in the future. This idea that the Left has that they can ‘clobber the rich’ is the most ridiculous fantasy I’ve every heard of. To ‘clobber the rich’ you have to gain power – which requires money that you have to get from the rich. And then when you do ‘clobber’ them you’ll find that it doesn’t reduce their power one jot. Taxing the rich to reduce their power is like trying to take away the eggs to unbake a cake. The power comes from the network. The money arises from being in the network. We should be looking for distribution of real goods and services in equitable terms. That’s actually what people are after. If Capitalist Accumulation requires the numbers to be slanted, then let them be so. Just make sure that doesn’t matter except for the egos of the capitalists. That Labour should focus on ‘advancing well-being and creating full employment and the deficits will take care of themselves’ was an idea put forward by Keynes in 1933 on the radio, to wit, look after unemployment and the budget will look after itself. How far we have fallen. Neil, you may well remember Healey saying that he was going to squeeze the rich till their pips squeaked. Good for the gallery at the time, but an absolute nonsense of an economic policy. That said, inequitable distributive functions must be altered towards greater equality or the democratic process becomes dysfunctional. I used to believe in squeezing the rich too. That belief rose from wanting them to cough up the money they stole from the rest of us. I couldn’t stand how some of them are so wealthy and the rest are so poor they can’t afford basic needs. Certainly, part of it was the belief that they took too much money, leaving the rest of us without it. Of course, with MMT, all of that is nonsense. I agree with that. =) Emphasis on separation of REAL goods and services from financial claims is one of the best concepts MMT teaches. Yes I have heard of a pension fund, but like many people who haven’t been able to afford to contribute to one, and/or don’t want to bankroll city traders, I don’t have one. They are not compulsory for the self employed, and there’s no need to be sarky. It’s not just about rich individuals but also huge corporations avoiding taxes. Why should they have that advantage over their smaller business rivals? By avoiding the moral question of ‘fairness’ in favour of dry theory, MMT risks being identified as supporting the Leona “taxes are for the little people” Helmsley principle, and it’s not a good look. The creation of huge dams of money must have some distorting effect on the markets, similar to the effect of water dams on the water cycle. One would be the downstream withdrawal of money supply and hence the flow on and cascading withdrawal of demand, deflationary unemployment spiral, etc. The JG handles this threat nicely. The other is the the shear obligatory weight of all that potential demand hanging over the market. Living or just standing under a dam has quite the psychological effect. It threatens to sweep away your everyday life at any moment. I’m not sure that threatening to use the state’s infinite sized dam to provide an superior opposing demand flood will do anything to quiet the minds of potential victims. It will probably just cause a massive wave collision, tidal surge disaster. Bleeding off the damaging stored demand seems more sensible. Some sort of mildly inflationary wage regime might be most palatable? They don’t. The same rules apply equally to all. The fetishisation of “small businesses” and the “self-employed” is just as daft as the “tax the rich” mantra. Small businesses are notoriously bad at looking after workers and are often parasite businesses that shouldn’t exist. The Job Guarantee will eliminate quite a few of them once workers have a choice of working for an employer that pays them properly, and offers training and access to a pension. That pruning of both large and small ‘businesses’ then leaves room for those that are truly effective to grow. The left is obsessed with the word ‘fairness’, but only for a narrow definition of fair – which is to ascribe moral purity to those people who fit certain categories they approve of. Unsurprisingly in wider society there is a diversity of opinion of what is ‘fair’. Unfortunately diversity of opinion is the one diversity the Left appear to be dead set against for some reason. It is perfectly fair for a capitalist to count their virtual tokens if that is what they like doing, as long as in return they accept an equitable distribution of real goods and services to everybody and the final elimination of poverty. That’s a negotiated win-win between peoples who see the world through very different eyes. I just cant get my head around that almost everybody think it’s normal that a lot of CEO’s here in the Netherlands are paid millions and milions each year plus bonusses, which people think they actually are worth it. And in the mean time, corporations try to get rid of everybody above 40 (like reapplying for your own job), or do vocational retraining which you have to pay for all by yourself and during training do not have an income, and for almost every function there are an internships and traineeships available, supposedly this is the new way to innovation and of course so that they just have to pay a small compensation. And have you lately looked at those job ads, today you will need university to get a cleaning job. Yesterday I saw this job ad for students at a well known retailer named AH (Albert Heijn) which quotes “Perhaps the most important job of Netherlands. Mean something!”. After having worked this nowadays maximum term of two years my niece of 21 did not want to apply for unemployment benefits because her friends thought she was denigrating herself. My nephew was advised by the army during is approval testing, not to apply for unemployment benefits because it would not look good on his resume. Ultimately, he did because nobody offered to pay the mortgage on his house when he had no income! It looks like really everything is superlative and at same time entropy, but maybey it’s that black hole that is lurking, which makes me wonder what comes next, comedy, horror, God or the Devil? I’m not sure if the Guardian is a newspaper or an investment fund. It’s latest accounts says it is worth about a billion gap with 200 million in cash and 700 million in available for sales financial assets. I find it strange that they are putting out the begging bowl to its readers for donations to help it keep doing what it does. I get what you are saying, and I get the “neutrality” of MMT, I just feel that yet more counterintuitiveness is adding yet another hurdle to its exposition! Lots of points you raise that I’d like to discuss, but too bothersome to type – would love to take this discussion to the pub though! While I realise that “taxing the rich more” is meaningless in MMT terms, I still see it as necessary to reduce the inequality. It is the sheer inequality that allows the rich to subvert our democracy so easily through paid for and implicitly paid for (through owning newspapers etc.) propaganda in the media. You could say the same thing about large charities – most appear to be investment funds, with a few lifeboats, cat sanctuaries, or medical researchers thrown in for good measure. What happens if major capitalist countries do tax the rich’s income at high rates. the post war settlement at over 80% at times . boomer bank of mum,dad ,grandad and grandma. Fiscal stimulus without fiscal transfers is not progressive at all. The clue is in the name progressive taxation. The Republican plan is two-step, and using these tax cuts to blow up the deficit is just step one. Step two is to use deficit hysteria to cut social programs. By pointing to the deficits, Ms. Pelosi is preparing the ground for step two.